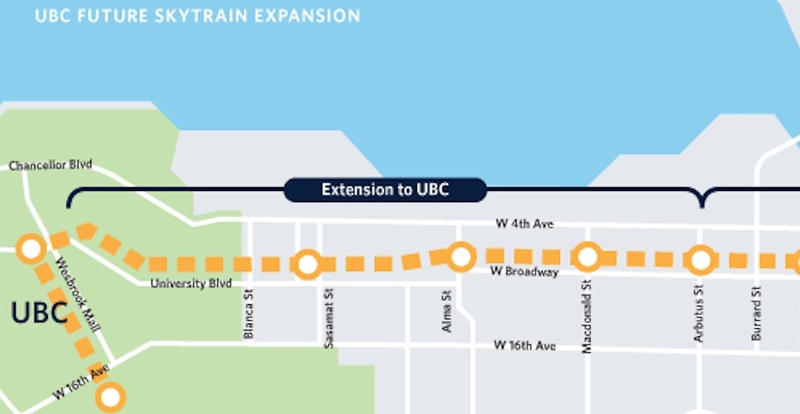 Vancouver City Council has approved a staff recommendation to advance rail rapid transit planning between Arbutus Street and the University of British Columbia’s Point Grey campus as a seamless SkyTrain extension. But the vote was not unanimous, with city councillors Colleen Hardwick (NPA) and Jean Swanson (COPE) voting against, making it a 9-2 vote. The ball on extending SkyTrain beyond the Millennium Line’s future western terminus at Arbutus Street is now in the court of TransLink’s Mayors’ Council, which is expected to make the final decision on proceeding any further in a meeting scheduled for February 15, now that regional leaders know the City of Vancouver’s official position. Today’s vote also signals city staff to work with various partners, including UBC, to design the extension further, including public consultation to determine station locations, the exact route, and the portions that will be elevated and tunnelled. City Council took the advice of an independent technical report commissioned by senior planners from both the City and TransLink that strongly identified that SkyTrain, not street-level LRT, is the only technology that provides the long-term needs of the Broadway Corridor and overall east-west transportation needs in the region. “Today is a decision to keep the work going forward with the SkyTrain. It is the only one that meets the needs of Broadway,” said Jerry Dobrovolny, the chief engineer and general manager of engineering services for the municipal government. City councillors were warned that a rejection of the project today would miss possible senior government funding opportunities, especially from the federal government given that an election is scheduled for fall 2019. Mayor Kennedy Stewart, who has been actively lobbying the federal and provincial governments for funding, said the project will fall out of the regional plans if City Council were to vote against the plan. He cautioned city councillors and public speakers over any consideration of delaying the decision for further study on technologies or even after the years-long process of creating a citywide plan. “This is our window of opportunity. If we decide to refer it or defeat it, then that’s it. The federal money will go elsewhere… They won’t wait,” said Stewart, adding that there is intense competition within the Mayors’ Council to secure funding for other regional transit projects. Metro Vancouver is also going against new funding requests from transit systems in Toronto and Montreal. Dobrovolny also noted that SkyTrain on the Broadway Corridor would resolve the existing bus capacity issue established by the already high-capacity 99 B-Line and eight other overcrowded east-west bus routes in the city. Throughout the day, there were approximately two dozen public speakers, with the business community, UBC students, Vancouver Westside residents, and special interest groups represented. While businesses and students largely expressed their staunch support for SkyTrain, some local residents and groups wanted further consideration for street-LRT over the higher cost of SkyTrain, their disbelief of the high future ridership and demand figures presented by TransLink’s report, and concerns over the potential impact on housing costs and land use in their community. “We’ll be ensuring that we do transit-oriented development right and that we do equitable transit-oriented development,” said councillor Pete Fry. TransLink expects a full SkyTrain extension between VCC-Clark Station to Arbutus Street will attract 192,700 daily boardings by 2045, with 118,800 daily boardings coming from the span between Arbutus and UBC. This would bring the total ridership of the entire extension between VCC-Clark Station to UBC to a staggering 311,500 per day — about twice the current ridership of the Canada Line. The end-to-end travel time along this entire span is estimated to be about only 20 minutes. Comparatively, street-level LRT’s ultimate maximum capacity of 6,120 passengers per hour per direction provides just 25% of the ultimate maximum capacity of SkyTrain, and at a much higher cost. It will also attract significantly less ridership and reach capacity by around 2045, just 15 years after the estimated 2030 completion of any rail transit extension to UBC. Construction on the $2.8-billion Millennium Line Broadway Extension portion between Arbutus Street and VCC-Clark Station is scheduled to begin in 2020 for an opening in 2025. It is anticipated business case work for the final journey to the campus could begin in mid-2020, but this is subject to the Mayors’ Council allocating $30 million to $40 million for the detailed planning work.